One of the most incredible things about Lake Tenkiller, is that simply by going to the lake – you’re in a unique piece of paradise. The emerald waters, cool breeze and beautiful tree lines – just being in that atmosphere is priceless. Especially when “price” matters. 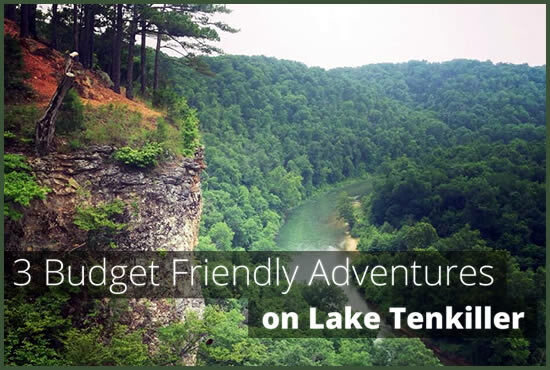 It’s not easy (or cheap) mapping out a vacation, but luckily, if you find yourself visiting Lake Tenkiller, you’ll be pleasantly surprised that most of your fun is pretty inexpensive, or even free! We at Terrapin Peak BBB strive to ensure our guests have the optimum experience, including experiences that are in their budget. Here are some key Tenkiller activities that certainly won’t break the bank. Ah yes, it’s simple but just laying your eyes on the lake’s welcoming waves, you’re going to want to spend quite a lot of time there. We have a lot of visitors come to Tenkiller and simply spend their weekend (or more) around the Lake. It’s a great spot for swimming, and if you have a boat, you could spend all day exploring the waters, fishing and simply anchoring and enjoying the serene wildlife around the lake. Boat rental rates vary by hour, and company, but they can be as cheap as $100 for an afternoon. This is a pretty fair price considering it’s easily an all-day affair. If you don’t want to cash in on a boat, you can also simply swim the lake, or get a little workout in, too by cashing in on a kayak or canoe. Lake Tenkiller’s nature paths are some of its most popular offerings. From the late spring bird watching, to the year-round hiking, it’s a free, fun and adventurous activity. Tenkiller offers trails in wide varieties of intricacies and lengths, and it’s a great way to start or end your adventure on the lake. A lot of guests will take a morning hike, or one at sunset. The trees, wildlife and cool lake air, really help in making the nature trails a very fun experience. This entry was posted in Lake Tenkiller, Spring by Mark Marcelletti. Bookmark the permalink.